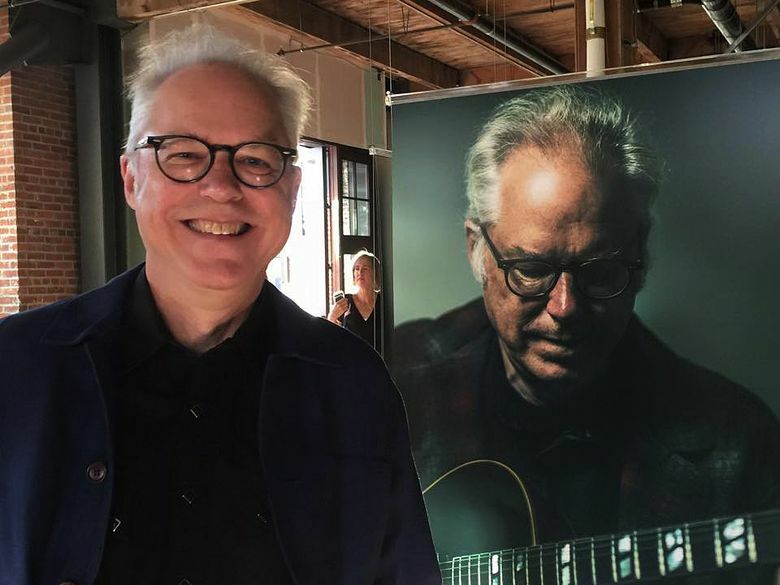 A cavalcade of Seattle music stars at the opening of a photography show; the 5th Avenue Theatre honors Herman Sarkowsky; and swimming for other people’s lives on Lake Washington. None of the people photographed for “Musician: A Portrait Project” were allowed to see the images before the opening party at Union Stables the other night. So people like jazz legend Bill Frisell and Soundgarden guitarist Kim Thayil were wandering around in a mix of excitement and nervousness. By the time Frisell found his portrait, he was feeling just plain homesick. His wife, Carole d’Iverno, (they just celebrated their 36th wedding anniversary) loved the portrait of her husband — and those of everyone else. That something had a lot to do with “Musician” photographer Ernie Sapiro, who couldn’t wipe the smile off his face. His work was up; his wife, Cathy, and kids Tess and Tucker were there, and everyone was happy with what took years to produce. Same for producer Nancy Guppy, who was joined by her husband, Joe, her parents, Alden and Bev Harris, and her sister, Anne Baumgartner, who flew up from California (surprise!) just for the show. Kurt Bloch served as both a portrait subject and deejay for the night, spinning solely Seattle music. “I will go on record saying Ernie did an excellent job,” the Fastbacks guitarist said of Sapiro. (Thank you, kind sir). TKO and Warbabies frontman Brad Sinsel loved how easy his shoot with Sapiro was at the Gibson Guitar showroom a while back. “It was all pirate,” he said with a grin. “You just had to have blind faith,” said Susan Silver, another subject and the former manager of Alice in Chains, Soundgarden and The Screaming Trees. The event featured Top Pot doughnuts, which gave Sinsel pause. Other smarkalecks included April Cameron, wife of Pearl Jam and Soundgarden drummer Matt Cameron; and Kim Virant, wife of Chris Friel Orchestra drummer Chris Friel, who posed beside the portraits of their beloveds in mock fangirldom. Then Virant, a solo artist who also fronts Lazy Susan, took a look at her own portrait. One of the kindest tributes you can make is to compare someone to George Bailey, the protagonist of “It’s a Wonderful Life” who was rich with family and friends, and saved his town from ruin. Sarkowsky, who died last November, was the co-founder of the Seattle Seahawks, president and owner of the Portland Trailblazers and an early investor in Emerald Downs. But he and his wife, Faye, were also two in a group of local leaders who saved the 1926 landmark theater from demolition in 1979. Later on, Faye Sarkowsky became the first woman chairman of the theater’s board. She was there the other night, along with their children, Steve and Cathy; Steve’s wife, Stacy, their children Noahand Shia, and Cathy’s son, Max. Somewhere out there, some 300 people were churning through Lake Washington, making their way from Medina to Madison Park in the 18th annual Swim for Life, a fundraiser for Bloodworks Northwest (previously the Puget Sound Blood Center). The event, co-founded by Bob Forgrave (who did the 2.5-mile swim the other week) raised $80,000 for the nonprofit’s programs. They include supporting the national bone-marrow registry and expanding the blood bank. No small things. Standing on the shore was Alan Schulkin, a former board member who battled testicular cancer and leukemia, and was a bone-marrow recipient. He did the swim in 2005. “It’s bracing,” Schulkin said as we watched the bobbing heads get closer and closer. The first swimmers to reach shore were Corey Ebbin and Dean Perkins, who called themselves The Percolators, and rightfully so. They made it across in just over an hour and raised $7,000 for the cause. “You really have to go to a spiritual place to stay calm and focus on your breathing,” Perkins said. Ebbin, a Bellevue chiropractor, just started swimming six months ago, and trained three days a week to make the crossing. “For the greater good,” he said.